While property investment is an excellent vehicle for growing lasting wealth, occasionally it’s the wrong fit for certain people and their expectations. Many naive investors think negative gearing is an investment strategy. Their accountant tells them they need to save tax so they chase tax deductions or depreciation benefits and as a result they often overpay for new or off the plan properties while ignoring the fundamentals of property investment. They think they need negatively gearing and get excited that for every dollar they lose they save 49 cent. Now that’s crazy, especially as new stock almost always comes at a premium and has limited (if any) medium term capital growth prospects. That’s not the way to grow your wealth through property. This is not an investment strategy – it’s a short term funding strategy, which only makes sense when used to purchase high capital growth investment grade properties. These tend to be established houses, townhouses or apartments in desirable streets in top locations in the inner and middle ring suburbs of our three big capital cities. Have you heard of FOMO? – The Fear Of Missing Out. It usually happens at this stage of every property cycle when people read of the windfalls made by those who bought property a few years ago, however this is the time of the property cycle you need to be more cautious in your investing rather than over optimistic. Of course it’s an understandable emotion, but investing with emotion leads to bad judgement. And it is exactly this type of emotion that makes you easy prey for the property marketers and spruikers who will offer you a way to get rich quickly. However, property investing is a long-term endeavor. It takes average property investor 30 years to become financially free. Often it’s takes 10 years to learn what not to do – we all make investment mistakes when we start out. Then it takes three to five years to undo the mistakes of the first decade, often selling off underperforming properties. Many people mistakenly believe they understand property investment because they own a house or have lived in one. So they end up buying a property close to where they want to live, where they want to retire or where they holiday. Again, these are emotional reasons to purchase a property rather than selecting based on sound investment fundamentals. On the other hand, successful investors have formulated an sound investment strategy that suits their risk profile and helps them achieve their long term goals and one which has stood the test of time. If you haven’t learned how to budget, spend less than you earn and save or if you’re not good at handling debt then property investment may not be for you because the large amount of debt you’ll take on for your investment will either get you into financial trouble or keep you awake at night. Of course if you’re scared of debt, and many people are because they don’t fully understand the difference between bad debt and good debt, then steer clear of property until you better understand the power of leverage, compounding and time has on well-located properties. If you are buying your property with the aim of creating wealth but also as your future home, or as a part time holiday home or somewhere to retire in the future, then perhaps you are wanting that one little property to achieve too much. 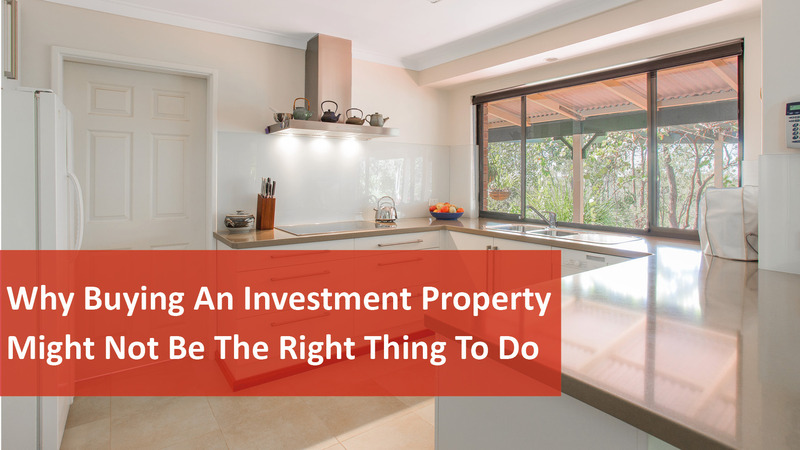 Of course, adhering to a proven investment strategy will mean you’re more likely to buy an investment grade property and not make this type of mistake. Property investment is a game of finance with some real estate thrown in the middle. To get into property you should have a stable job, profession or business with a steady income and need to be attractive to the banks so they lend you money plus you should have sufficient stashed away in a financial buffer to see you through the inevitable rainy days ahead. If you can’t afford an investment grade property, either because you haven’t saved a sufficient deposit or you can’t service the loan repayments, then rather than buying a secondary property, it’s better that you wait and buy an investment grade property. One of the reasons that around 50% of those who get into real estate sell up in the first 5 years and the main reason around 90% of investors never buy more than one investment property is because the first property they buy underperforms and they lose confidence. Less than 5% of the properties currently on the market are “investment grade” – the type of property that will outperform the averages with wealth producing rates of return and stability of price when the markets eventually turn. You make your money when you buy your property, not because you buy it cheaply, but because you buy the right property. Sure property markets move in cycles and it would be great to buy near the bottom, or find a location that will be the next hotspot, but the landscape is littered with investors who tried to time the market and failed. Instead the right time to buy real estate is when your finances are in order and you’ve got the ability to purchase an investment grade property. Remember there is not one property market in Australia so there will always be opportunities somewhere. Rather than wait and buy real estate; you buy real estate and wait. When it comes to buying property, there are plenty of reasons to take action, but there are just as many reasons to hit the pause button. If you’re not sure on your next move, speaking with a professional property advisor may give you the clarity and direction you need to move forward with purpose. With over 20 years combined knowledge, our Property Managers know a thing or two about investment properties and asset management. Give them a call on (08) 6254 6300 for an obligation free chat.